So, you found the site, good job, well done! You’ve also clicked around a little and marveled at the huge amount of information that is available, read a few reviews and looked at a google map with lots of little icons all over the city. But, all of this causes a small problem, just which of all the glorious gluten-less goodness in Berlin should you visit/try first? 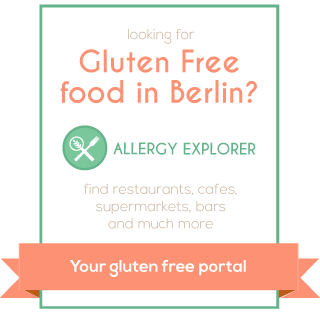 Well, this is where I can help, with my Top Recommendations for a gluten free life in Berlin! Galettes are fast becoming my favourite gluten free meal these days, they have a wide variety and some vegetarian options. Plus, their cider is the best. One of my favourite gluten free place in Berlin, they have a wide selection of lunch options and usually a couple of choices for dessert. A good large selection of Ice Cream (with gluten free cones) and many gluten free cakes on offer. They have also started serving meals and other treats, cookies etc. A definite place to visit on your trip to Berlin, there is nowhere else with a better selection. The BEST gluten free pizza in the city. Better than Simela in terms of food and atmosphere although a little more difficult to get to. They offer a vegan gluten free brunch, at the moment every weekend, check their facebook page for up to date information (if the vegan part puts you off, please read my review first! There are places like La Mano Verde, Cha Cha and Block House where they have written gluten free next to the things that they sold anyway without gluten. Unfortunately there are not many bars that stock gluten free beer. You’re best bet is to try Dirty South or one of the other restaurants listed above, if you’re looking for a regular bar with gluten free beer you’re out of luck at the moment (June 2014), there are none. If you’re looking for a single place to go to where you can stock up on a fair range of gluten free food, go to the Vitalia at Friedrichstrasse. They have an entire wall of products from various suppliers and a freezer section with pizzas, lasagna etc. See the berlinale page for details here. DM – Near to Saturn – They offer some gluten free products not available in the other shops. Rossmann – In the basement of Alexa – As with DM, they have a limited selection (mostly biscuits, flours and pasta) but of a different brand than other places. Mandel Hornchen – these are available behind the counter. Thanks – we will be visiting Berlin soon and the information on your blog will be very useful! hi, i am visiting berlin and had a wonderful gluten free meal at Sarah weiner’s restaurant complete with bread at the beginning of the meal. the staff asked in the kitchen what they could offer and there were several options on the menu. Hi, we’re going to berlin for Easter. I think your blog will help us a lot. A great thank you for this job. Bratwurst is generally ok (as are most sausage products here) but I’d always check first to be sure, there is a good currywurst stand at the saturday market on kollwitzplatz (search for restaurant zander in google). Eisbein (pork knuckle) is usually safe, it’s pretty much just pork and potatoes, I’ve heard that Gambrinus on Linienstraße is pretty good for traditional berlin food. Oh, and Essen Fassen sometimes have a gluten free schnitzel, check out the review. Hi Have you tried: Il cielo di berlino? Monumentenbrücke! They have very good GF PIzza! I have been there twice! You should make a visit for your Blog! Thank you again for your useful tipps and Ideas! Hi, no, I’ve not been there yet, thanks for the tip! Do you have any info on a glutenfree Döner place? A lot of them offer boxes (so no bread), but the meat isn’t always safe unless you ask and inspect everything they put in there apparently. No, I’m not aware of any that are definitely gluten free. I’ve been to a couple where they say there is no gluten in the shawarma (Zweistrom in Prenzlauer Berg for one), but whether you believe that they know what they’re talking about is another thing. SiAn in Rykerstrasse 36 (Pberg) is not “ufficially gluten-free” but they garanteed that everything is naturally gluten free. The traditional Viet cusine uses only rice. I ate everything without consequences – and i loved it! Brilliant blog, I just wish I’d found it before I went .. at least I’ll have the information when I go again, thank you. Your blog is a lifesaver for me as I will be traveling to Europe in June with my gluten-free family. Now we will know where to eat and shop for our food! Thank you so, so much! We’re going back to Berlin, for me since 1972 when I studied there. My wife has celiac disease so this information will be very helpful. Our travels are as much food and restaurant people adventures as sightseeing and museums. It will be strange for me without the wall around the “island” of Berlin. I’m looking for gluten free beer. Do you know where can I find some? You can buy it in most bio/reformhaus markets. We have just returned from a trip to Berlin and I found your website so helpful in allowing us to plan where we could eat. We tried Simela and Cha Cha and they were both excellent and my daughter (who is coeliac) loved the food there. We also ate at the Augustiner am Gendarmenmarkt (Charlottenstraße 55, 10117 Berlin) and they were very helpful. There is nothing marked gluten free on the menu but our waiter happliy checked with the chef (we had brought a list in German of what my daughter could not eat) and they told us that all their sausages were gluten free. My daughter loved her meal of Nuremberg sausages on mashed potato, served with a sauce made without flour. She is very sensitive to even small amounts of gluten and had no reaction at all to eating this meal. We ate there twice during our stay. Great to hear you had such a good time, thanks for the tip about Augustiner. Hi there. I work for Sauvage. I just wanted to let your readers know that we are a 100% Gluten-free restaurant–and we’re not hiding it! Since we have never served anything with gluten and no gluten has ever entered our kitchen, there is absolutely no risk of cross-contamination. A lot of customers come to us with concerns about this and many learn about the restaurant through your blog post, so I thought I would put that information out there. To my knowledge we are the only restaurant in the city where there is no cross-contamination risk and where diners can eat worry-free as well as gluten-free. Thanks, I’ve updated the post to help people a little more. thanks, such a useful blog, even for a gluten free vegan! Hi, nice blog..always appreciate those that go to time and effort to circulate the news thats so helpful to some! So..I am coming to berlin for a month next week. I have a 100% gluten free cafe in uk but coming for a non related creative escape. I wonder..do you know if there are shops that stock gluten free flours for cakes and break making? Here we have “doves farm” brand…i still have to stay busy experimenting aked and stuff for my shop! (no rest for the wicked)…any extra info would be great. Thank you. Probably your best bet would be to go the Vitalia in the Friedrichstrasse train station (see the link below). They have products from most of the German gluten free manufacturers and I’m fairly sure they’ll have the flours too. I’ve used one of the Schär mixes in the past but they’re not as good as the doves farm brand. Try out Chén Chè, a Vietnamese place with a wonderful milieu and delicious food, gluten-free. Also fine vegetarian options with tofu. Great, thanks for the tip, I’ll check them out. But what about bread, this one is killing me! The bakery attached to Netto has bread and rolls to order now in most branches, tastes remotely bread like. Anybody got any easy access suggestions for gf bread? Heading to Berlin as part of a school trip next year, and this website has helped a lot. I’ve been freaking out about what I’m going to eat there, as I’ve never been there before, and this has certainly eased some of my fears. Thank you! Great! Don’t worry, there are quite a few gluten free places to eat here now thankfully. Be sure to check out http://www.no-gluten.de/ too, they opened about a month ago and are 100% gluten free!